-Moisturizing herbs to offset the tendency of the Metal horse to have tight, dry connective tissues. -Specific vitamins and herbs are included to help the Metal horse build strong immunity. -Digestive support herbs are provided to enhance proper breakdown of foods. -Additional amino acids are used to support the mood of the Metal horse to help him be more flexible and open minded when learning. Stress is going to be a part of our horse’s lives so it is important to recognize it. Often stress behavior is mistaken for bad behavior and the horse is punished which creates more stress. A better option is to offer specialized nutritional support to mitigate the stress emotions. If the negative stress emotions are lessened then they are less likely to lead to behavior or physical health issues in the horse. In other words, if we can’t make the stress go away we can help the horse have less of a negative reaction to it. Reducing stress emotions is an important part of the principle behind the Five Element balancing formulas. These formulas are very carefully designed to provide each horse temperament with the nutrients specifically needed by his type when under stress. Providing these extra nutrients will decrease the occurrence of stress emotions. We are ready to take orders for these balancing formulas. If you don’t know your horse’s type we have expert Temperament Consultants to help you. 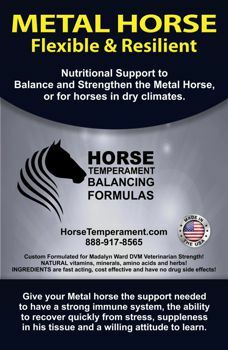 We are excited to offer Five Element balancing formulas and are very much look forward to hearing from you on how they are working for your horse. So far the feedback has been quite positive.